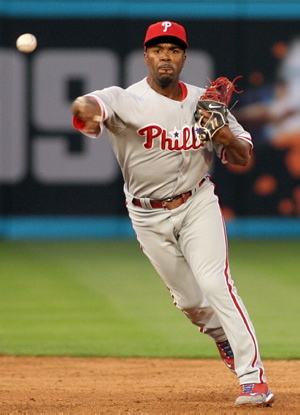 The Phillies just announced that SS Jimmy Rollins is going on the 15-day Disabled List, retroactive to yesterday, due to a right calf strain. The team purchased the contract of INF Wilson Valdez from Class AAA Lehigh Valley. “He slipped coming out of the dugout bathroom”. Don’t laugh, I actually went through a delay when a player got stuck in a dugout bathroom. They actually had to call the local police and use one of those big rammers that you see used when the cops are breaking into a drug dealers house. Anyway, Juan Castro will, no doubt, be the Phils starting shortstop for the next couple of weeks. He will most likely bat eighth in the order with CF Shane Victorino moving up to the leadoff spot. And take note about Valdez being called up. He is out of options. So when Rollins does come back, Valdez is going to have to clear waivers in order to go back to Triple-A. The other players in the thought process to get called up would have been INF Brian Bocock or INF Cody Ransom. It is a good thing that they like to put in that “off day” just in case Opening Day is rained out. Monday was a beautiful day… sunny and in the 60’s. Yesterday was rainy and cold. Today is sunny and in the 60’s. Going to be a beautiful night tonight.